Traditionally, prayer cards are mass-produced religious cards usually depicting a religious scene or a saint on one side of the card and a prayer on the other side. These are typically used and popular among Christians and become widely accepted even as a meaningful keepsake for those who attend a funeral, visitation, and memorial services. A funeral card also serves as a tribute to and a way to honor the deceased. 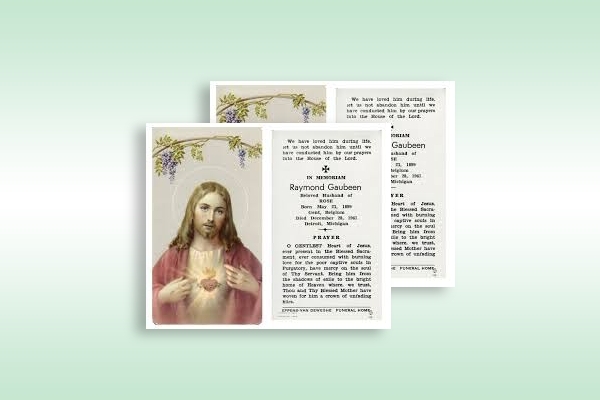 Because these are used as a keepsake, the card is designed with a photo of the deceased or an inspirational image on the front and a Bible verse, poem, or short biography of the deceased at the back. Nowadays, as customization becomes more accessible and affordable, we commonly see prayer cards that are designed in secular themes but still somehow preserving its devotional touch, as these cards are adopted for use as a memorial tribute. Designing one might require extra effort and time, but with help of the examples and templates of funeral prayer cards presented below, you can easily achieve a professionally designed funeral prayer card. Honor your departed grandmother by creating a funeral prayer card for her which you can distribute to the guests and family members of the deceased as a keepsake. 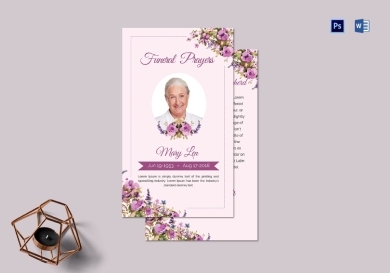 We know that you are doing anything else related to the funeral; hence, we provide you this funeral prayer card template for grandmother so you can still create a beautifully designed card within a few minutes. You only need to spare a little time when you use this template as this is easily downloadable and customizable according to your own preferences. 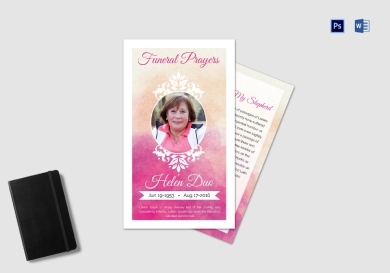 With the use of this funeral request prayer card, your well-designed funeral card is just right at your fingertips. This template is very convenient for the users because it can easily be edited using various computer applications and programs that can open MS Word and Photoshop file formats. In this template, the floral background just perfectly complements the cursive font at the front of the card. You can edit the text and photo and incorporate the picture of your departed loved one. At the back, you can edit the text and include your favorite saying or verse or prayer or a message that will remind you and your family of the deceased. 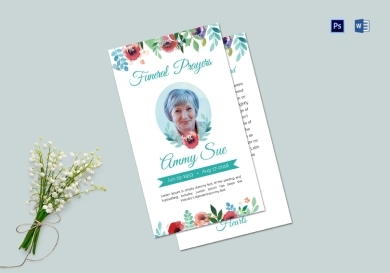 Because flowers are said to calm and give peace to the mourning family and friends of the deceased, they are typically included in the design of the card, especially on the background, just like this essence large prayer card template. The fuschia pink accents make it appear striking and soothing to the eyes of the reader. You are free to edit the name and photo as well as the text at the back of the prayer card. Need to create a prayer card but only got a little time to spare? Never worry for we are here to help you. 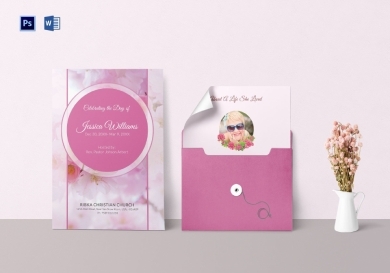 With this funeral card template for loved ones, you can easily create a prayer card with less hassle and in only a short period of time. The graphics and designs are in high quality and are made by professional designers and graphic artists, and you are free to incorporate your own designs design elements. This will guarantee you a prayer card that can surely be remembered by your guests and relatives. In this sorrowful moment of your life, it might be tough for you to design a prayer card for the deceased, but you need to get up on your feet and prepare for the necessary funeral arrangements. Along with the things you need to prepare is a funeral prayer card so you can give them to the family members as a keepsake. You might need to have a professional designer to do it for you, but this would cost you a lot. The great news is you can still design an equally well-crafted prayer card. This can be done through the use of this funeral family prayer card. This is available in different file formats, MS Word, making it easy to customize to tailor fit your specific preferences. This example of a vintage funeral card features the image of Jesus Christ on the front and the details of the funeral and brief information of the deceased at the back. The designs and texts are simple, making it look simple yet elegant. Note that in this prayer card example, it does not feature a photo of the deceased. So, the next time you are to create a prayer card, you can decide whether or not to include a photo of the deceased. Funeral arrangements and preparations can really be burdensome especially during this tough time of your life. You need to stay strong and arrange the funeral program, service, memorial, and all other things related to the funeral, which include an obituary, death notice, funeral flyer, and of course, funeral prayer cards. 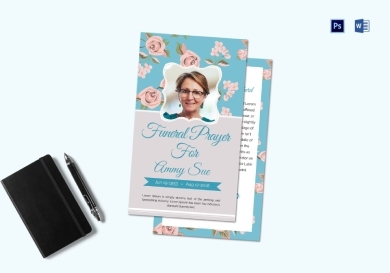 So if you are having a hard time creating from scratch, you can always refer to the examples and templates presented above as these can really help you easily create a funeral prayer card in just a few minutes.